Today I’m going to tell you about an amazing side that I’ve discovered. 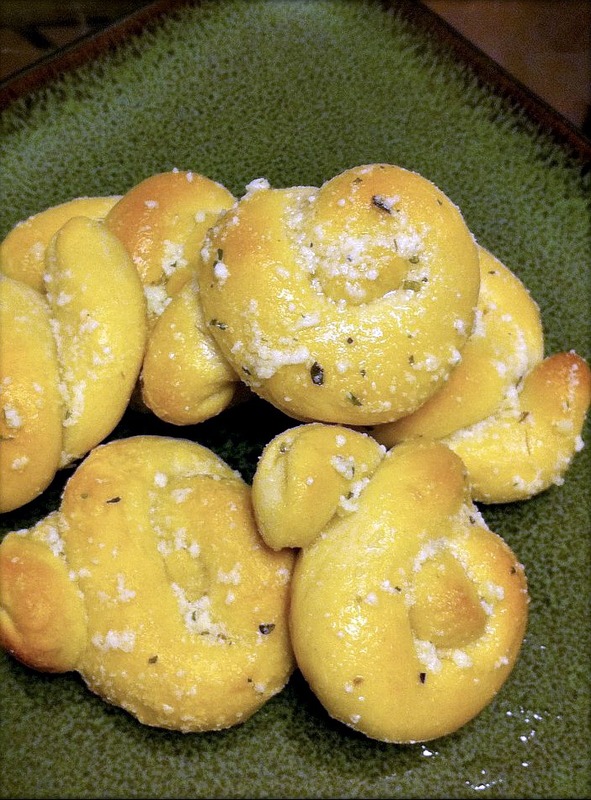 If you like garlic bread with your pasta, you are going love Parmesan Garlic Knots. If you get the generic biscuits in a can from Wal-mart, even if they aren’t on sale they are $1.25 for 40 so you’ll have plenty! And it will keep practically any pasta dish under $10 for your family! And the good thing is that they are completely compatible with any occasion. You need an appetizer for the big game? check. A side for a dinner party? double check. Served to your wonderful family? double checked with love and garlic. Roll each biscuit in your hands until a long string is made. Shape each string into a knot. Bake as directed on biscuit package. Mix rest of mixture together in bowl. Use brush to paint mixture on knots after baked. Easy recipe, great taste and the smell in the kitchen is very tempting! Calories? Why spoil a good thing, right? These look so yummy!!! Thank you for sharing this receipe!